Launch at next simulation start: will launch a recording process next time the simulation start button is hit. Record now! : starts recording a video file immediately. Press Stop recording! to end the recording process. Record window content: records exclusively the content of the main V-REP window (no dialogs will be recorded). Record desktop content: records the content of the desktop. With systems with several monitors, you can specify the desktop index via variable desktopRecordingIndex in file system/usrset.txt. Show cursor: if enabled, then the cursor will be visible in the video file. Show button states: if enabled, then the mouse button states, as well as the ctrl- and shift-key states will be visible in the video file. Hide information text: if enabled, then the overlay text at the top of the main view will not be visible. Select: allows selecting the video file location. Output type: the encoder/container that will be used for the video. The offered selection depends on the encoders on your system. It often helps to install a video player (e.g. such as VLC), which will automatically install a few additional encoders. X displayed frames result in 1 recorded frame: allows specifying what frames should be recorded. Automatic frame rate: the frame rate will be adjusted in a way so that x simulation seconds correspond to x video seconds. 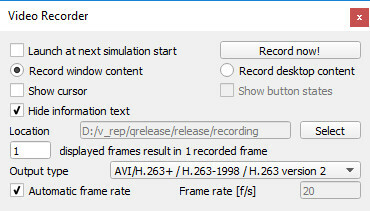 Frame rate: indicates the number of frames the video file will display in one second.